This has to be one of the most bizarre and inexplicable photos we've seen when poking around on Flickr. Write a caption using the comments. Here's our try: Fear the Metro. Yeah, not that good. You can do better! Tired of contracting the dreaded "Midwestern Tourist Snail Pace," Sally decided preventative measures were in order. 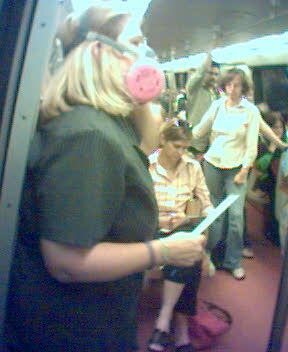 You never know when there might be a fire on Metro. While Metro won't allow food or drink in the system, feed bags are A-OK! the complex mingling of exotic aromas is simply too much for some. The "real" America's view of public transport. Excuse me, miss? Did they not explain to you at the clinic that you only need to worry about sleep apnea at night? Yeah, the system stinks. We know that. FACT: While many tourists from the heartlands have allergies to public transit, the DC metro, thanks to its limited scope and high delays, is actually hypo-allergenic (unlike those darned cherry blossoms)!